Given all the publicity surrounding the anti-Gay propaganda law in Russia, (which merely makes national a series of local laws already passed in 10 regions of the Russian federation since 2006) it seems quite extraordinary that any Russian biographer would dare to spend time speculating about whether his President is Gay, yet a book by a man called Belkovsky does just that. The idea is not that Putin’s recent divorce is the result of some sort of homosexual fling, but rather that Putin is “latently” gay, spends too much time with his dogs and that this is the result of being the son of an alcoholic. The affair with gymnast Alina Kabaeva is some sort of “beard”. “The small Vladimir,” goes the text, “grew up practically without a father and without the love and care of his parents. He was a withdrawn and grim child. Putin was born the son of an alcoholic two years before his official birth date. His mother moved to Georgia with Vladimir, only for the child to be shunted off to Leningrad a short time later to the couple who would become the official parents of the future president.” It makes one almost sympathetic. Poor fellow. I was two months’ premature, but Putin, says the text, is two years’ premature: I was abandoned and so was he, it seems. So desperate was Putin for a real family that he identified Yeltsin as a father figure and Roman Abramovitch as his surrogate brother. It seems that Putin spends most of his time with, and reserves all his affection for his two dogs, the Labrador Conny and Bulgarian shepherd dog Buffy. And then the writer goes on to look at his two daughters Mariya and Ekaterina. I cannot quite see where they fit into the story, though. Now, I will not speculate any further than Mr Belkovsky but the idea that Putin is gay sounds almost as far-fetched as the suggestion that Gordon Brown, or Prince Edward or even, God forbid our current Foreign Secretary might be harbouring homosexual tendencies. There will never be any evidence for a “latent” homosexual tendency anyway unless Putin starts sharing hotel bedrooms. Even then, that would only be evidence of his parsimony. Much the same rumour mill went wild about claims made in the 1960s that the then Pope Paul VI was gay, and the claims have been published in a small book by Franco Bellegrande. Paul VI at the time challenged the claims publicly and demanded a day of prayer for the perceived insult. In fact, what he actually got was a weekend of sniggers. Maybe, Belkovsky suspects Putin has been surfing the internet to whet his curiosity and that his internet history is about to be made public by Edward Snowdon? Somehow, I think this is unlikely. Maybe this story is there to mock all the sporting photo-opportunities, those bare-chested manly poses with fishing tackle in the snow, or maybe the author was thinking, on June 30th last year when Putin signed into law Article 6.21 about the Queen’s answer to her son Hamlet when he asks her if she is enjoying the play, “Methinks the lady doth protest too much.” We shall never know, unless Belkovsky is silenced forever or imprisoned. then we would really smell a rat. That is not going to happen. 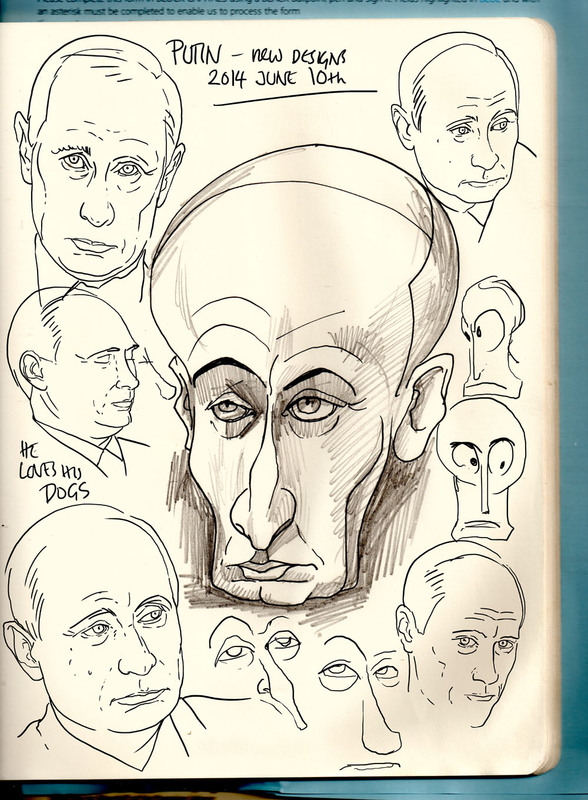 Anyway, for all that, Putin remains a joy to draw. I will post pictures of Paul VI later- many of the recent Popes have been fun to draw. Author timewilsonPosted on June 10, 2014 June 10, 2014 Categories UncategorizedTags belkovsky, is putin gay?, putin2 Comments on Is Putin Gay?